Summer is a time for vacations, backyard barbecues and relaxing by the pool – not the time you want to be worrying about your septic tank system. If you frequently entertain guests and have more people using your toilets, shower, dishwasher, washing machine, etc. then you may be unknowingly putting a strain on your septic tank system. This could lead to septic tank overflow, a saturated disposal area, unpleasant odors and/or water pollution. Keep these tips in mind as you enjoy a healthy and safe summer. If it didn’t go through your mouth – DON’T FLUSH IT….a good rule of thumb is not to flush things into the septic that did not go through your mouth (except toilet paper). Your system likes items that will easily decompose. In the long term it will help your septic system to work longer with less maintenance. Summer is a great time for you and your family to review the list and share with your guests…AVOID FLUSHING: cat litter, cigarette butts, coffee grounds, condoms, grease & oils, cotton swabs, dental floss, diapers, disposable wipes, feminine hygiene products, hair, kleenex, paper towels, plastics and static cling sheets. These items will quickly fill your septic tank with solids, decreasing its efficiency, and require it to be pumped out more frequently. They could also clog your septic system components or otherwise cause a system failure and leave a big mess. PARK VEHICLES AWAY FROM THE SEPTIC SYSTEM…Be sure you know where your septic system is located. And keep all vehicle traffic off the tank, pipes, and drain field. The only exception is the lawn mower. PUMP YOUR SYSTEM BEFORE THE PARTY…Check to see when the last time your septic tank was pumped. If you don’t know or if it has been more than 5 years, chances are it’s time for a pumping. You can greatly reduce the likelihood of failure, avoid costly repairs, and gain peace of mind by having your system regularly inspected and pumped as needed. 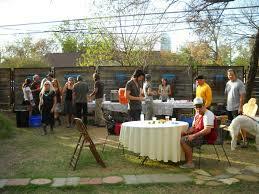 If you are hosting a large number of people, consider pumping your septic system prior to the party. The worst type of party fouls is a leaky smelly mess in your yard. You may also consider renting a CAT CAN PORTABLE RESTROOM for the event to take the pressure off your septic system. LANDSCAPE WITH LOVE…Summer may be the right time to do some landscaping renovations in your yard. Be mindful of any new plantings. Grass is the ideal cover for drain fields. You can also plant other very shallow-rooted plants or flowers. However, keep in mind that if you don’t have risers installed you will need to dig up the ground to access the tanks for inspection and pumping – generally every 3-5 years. Avoid deep rooted plants, trees, shrubs and vegetables over your system. As a general rule, trees and large shrubs should be kept at least 30 feet away from your drain field (depending on the root structure and soil type). Do not fertilize over the drain field. What Does It Mean If You Have Full Septic Tank? We are ready to serve your portable restroom needs. Give us a call today! Copyright © 2014 - All Right Reserved -Cat Cans Portable Services of Manhattan, LLC.